Home » The House Of Colour » Mix it Monday: Leather boots in Chalk Paint™ by Annie Sloan! For this weeks #mixitmonday I have organised something a little different, with the cooler seasons being just around the corner, what better than to demonstrate a pair of Genuine Leather boots painted in Chalk Paint by Annie Sloan. I’ve always wanted a pair of deep “grapey/ plum” boots. A rich. deep and dark coloured pair to wear with black winter tights and leggings- with all the pinks and nudes in store at the moment, it’s impossible to find and I’m not really one to follow the trends anyhow. So reviving my own boots it was…. read on to find out how to transform a pair of boots in under an hour. Okay so here are a very old pair of my “painting” boots, very loved and super comfy and also very sad and well worn. These are genuine leather boots. Chalk Paint will work beautifully on genuine leather. Leather is a natural product, it has imperfections and grain. If your boots are super glossy , and perfect, or your not sure, just double check to see if they are in fact leather before you decide to paint them as it may not wear as well on vinyl or PU leather. Then I painted two thin coats of this custom mixed Chalk Paint by Annie Sloan colour onto my leather boots and okay yes I have to admit, i didn’t bother or attempt to wash the existing Chalk Paint spots, you do want to make sure its clean & free of dirt though. After two thin coats of my custom mixed Chalk paint colour. I achieved full coverage, a Because I applied a thin coat on, the dry time was around about 10-15 minutes, once i finished one boot the other was more or less dry, so it didn’t take much time before it was ready for waxing. If I had wanted to keep the beautiful Purple created through the colour mix, I would have just applied clear wax over it (which would have made it a funky pair of purple boots, however I wanted something really dark & deep so I used black wax directly. This will tone down the purple, stain, richen and deepen the colour. The black wax will go into the grain and folds of the leather and will give the colour a lovely depth. When waxing you want to wax in small sections at a time then wipe the excess off with a lint free rag. Chalk Paint is porous so as you apply the wax it will absorb the wax through the body of the paint, it can only absorb so much and the rest sits on top and that’s the part you need to wipe off with a clean lint free rag. Chalk Paint will not repair any existing damage to leather it sit’s beautifully on top of the surface it’s been put on so if there are folds or existing cracks these will eventually reappear but is sometimes what gives it a genuine leather look. 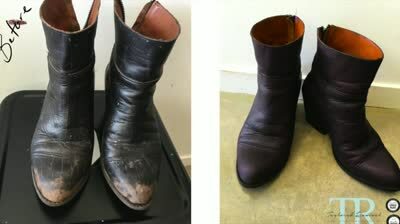 Make your coats thin, it won’t take much Chalk Paint to paint leather boots. Don’t over wax remember Chalk Paint is a porous paint so can only absorb so much wax. Don’t waste your wax, less is more. Your better to do two thin coats than one thick coat.